Each calendar year, you have a “goal” for your irregular categories. This number is what handles the math on the Plan page that recommends a certain amount to set aside each month to hit your goal. You’ll want to set your 2010 goal for each of your irregular categories. You can do that from the Plan page, by clicking on each irregular category and working with its pop-up box. BUT, we’ve created a page (https://www.pearbudget.com/set_up_2010) that shows you all of your irregular categories from 2009 and what you actually spent on them. It makes it a lot easier to make adjustments for your 2010 numbers as you’re getting started with the new year. You can see how it breaks down the total we spent for the year ($520.66), and how that broke down on a month-by-month average ($43.38). * Now, for some irregular categories, the monthly amount is the more important number. For other irregular categories, the total annual amount is more important. So we give you the math to figure out how much you want to plan on spending in 2010. We’re planning to spend a little bit less on Baby Stuff this year. To keep the math simple, we set it to $480 for the year ($40 a month). Also, note that small box in the bottom of the image. It’s a checkbox. If it’s checked, PearBudget will carry your balance from 2009 over to 2010. 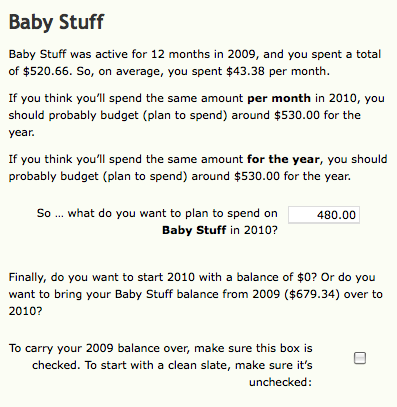 You can see that we were able to put more towards Baby Stuff that we didn’t actually spend (a lot of our “baby stuff” got wrapped into our “groceries” expenses in 2009). I don’t want to carry that into 2010, so I’ve unchecked that box. I’ll be posting some more in the next few days about getting into the new year, getting your budget in line, how to clean up older categories and whatnot. Stay tuned. For now, though, go check out your “set up 2010” page and get your numbers in order. And if you have any questions, please get in touch! * Note that if you created a category partway through the year, it’ll note that it was “active” for a shorter period of time. Also, note that “active” simply means “was a part of your budget,” not “you were actually spending money on this category in 11 different months.” If you create an account in March, but only spend money in December, it’ll still be “active” for 10 months. Make sense?